By Rule - requires only registration and, in some cases, a small fee. Used in most states if siting and design are low-risk and meet specific standards. By Permit - requires more information to be provided and often requires well monitoring. Common for wells that pose a higher risk to ground quality. Aquifer - coarse gravel or rock that contains and/or transmits groundwater. Attenuation capacity - the ability of soil and sediment to reduce the mobility of contaminants passing through it. Vadose zone - the area below the land surface but above the water table. Conducts but is not saturated with water. 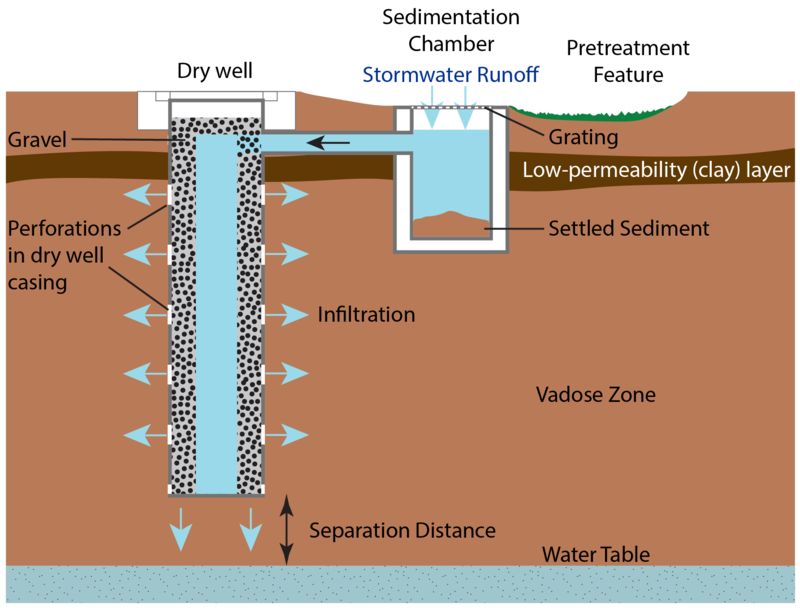 Dry wells improve stormwater drainage and aquifer recharge by providing a fast, direct route for rainwater to drain deep into underlying sediment and rock. Dry wells are most common in the western U.S. where clay or caliche layers slow down the natural drainage of water into underlying aquifers. However, there is concern that in bypassing some of the natural pollutant-removing function of soil and sediment, contaminants in runoff could enter groundwater supplies. Location and design choices can reduce this risk, and many states have developed guidelines and standards to help protect their groundwater. The US Environmental Protection Agency (EPA) regulates the construction, operation, permitting, and closure of injection wells, including dry wells, through the underground injection control (UIC) program as required by the Safe Drinking Water Act. 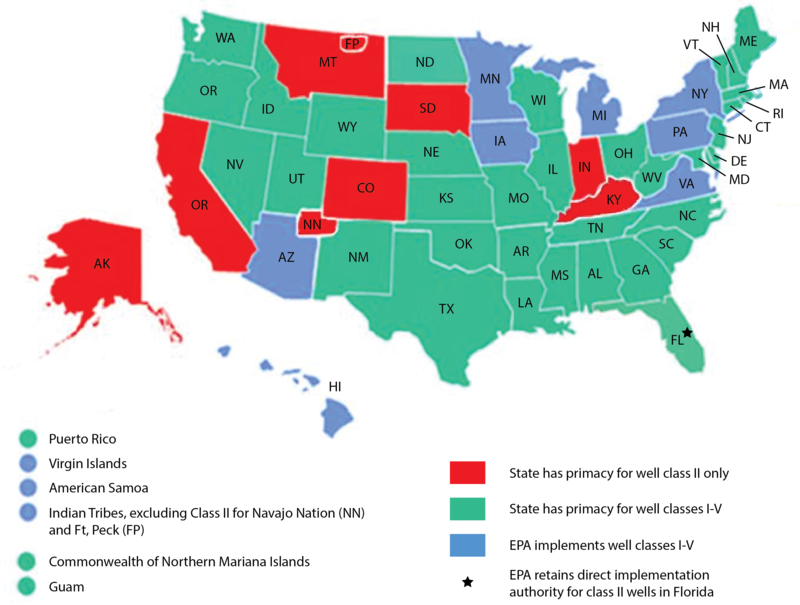 The majority of states have primacy or authority to implement and oversee their own UIC programs (e.g., Washington and Oregon, where dry wells are used extensively); the EPA directly implements programs in the remaining states (see map, above). Distance from Vulnerable Sites. Mandatory horizontal separation distances between dry wells and public supply wells, natural waterbodies, and other sensitive areas are common. A distance of 100 to 500 feet is commonly required to prevent contamination of public supply wells. High Risk Land Uses. Several states, including Oregon, Washington, New Jersey, and West Virginia, do not permit dry wells at vehicle servicing areas, gas stations, and other locations where hazardous chemicals could contaminate stormwater. In Illinois, these locations are discouraged but not banned. Other states, like Wyoming, require special equipment such as oil/water separators in dry wells near gas stations. Underground Considerations. Clays in the vadose zone serve a useful role by trapping pollutants, decreasing the risk of groundwater contamination. Some states consider this “attenuation capacity” of the vadose zone in determining separation distances from groundwater. Oregon uses vadose zone modeling to set limits on pollutant concentrations that are allowed to enter the dry well. Most states require 2 to 10 feet of vertical separation between the bottom of the dry well and the seasonal high water table. A dry well with two stages of pretreatment: grassy swale and sedimentation well. Image Credit: E. Edwards and B. Mandler. Pretreatment features, such as swales or sedimentation manholes, remove sediment and associated pollutants from the water before it enters the dry well. This helps prevent clogging and removes contaminants. Many states require some form of pretreatment. Washington uses the attenuation capacity of the vadose zone as a key factor in determining the type of pretreatment necessary. Oregon typically requires a two-stage dry well system with structural and/or vegetated pre-treatment. Delaware requires structural or vegetative pretreatment and upstream traps to prevent clogging from leaves and other debris. Some states, such as Idaho, where aquifer depths are commonly 200 feet or more, require no pretreatment. Regular monitoring - e.g., West Virginia (monitoring required twice yearly for contaminants of concern, or once yearly if the well is considered non-threatening) and Oregon (low-medium-risk wells are sampled twice the first year and annually after that; wells authorized under permits are monitored up to 6 times per year). Why are there differences between programs in different states? Although the regulatory and political environment has some influence on differences in dry well programs between states, many of the differences are due to different geologic conditions. States with greater amounts of precipitation, high water tables, or bedrock near the ground surface often will not use dry wells extensively, so the need for regulation is minimal. Other states, especially those with less rain and deeper water tables, tend to have more detailed regulations because their groundwater resources are less abundant and/or under greater strain. Underground injection control is generally managed and enforced at the state level. Click on the relevant link for more information about underground injection control and dry wells in your area: Alabama, Arizona, Arkansas, California, Connecticut, Delaware, Florida, Georgia, Hawaii, Idaho, Illinois, Kansas, Louisiana, Maine, Maryland, Massachusetts, Mississippi, Missouri, Navajo Nation, Nebraska, Nevada, New Hampshire, New Jersey, New Mexico, North Carolina, North Dakota, Ohio, Oklahoma, Oregon, Rhode Island, South Carolina, South Dakota, Tennessee, Texas, Utah, Vermont, Washington, West Virginia, Wisconsin, Wyoming. Can’t see your state above? The EPA directly manages Class V injection wells (including dry wells for stormwater drainage) in many tribal areas and a number of states, including Alaska, Colorado, the District of Columbia, Indiana, Iowa, Kentucky, Michigan, Minnesota, Montana, New York, Pennsylvania, and Virginia. You are free to share or distribute this material for non-commercial purposes as long as it retains this licensing information, and attribution is given to the American Geosciences Institute.